JOSE MOURINHO INSISTS he has no plans to join Paris Saint-Germain despite admitting he will not be signing a new contract with Manchester United in the immediate future. The 54-year-old also played down the idea of ending his career with United, but in the following days speculation emerged that Mourinho was about to put pen to paper on a lucrative new contract with the Premier League club. 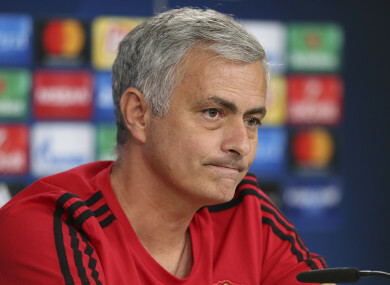 Quizzed on his future plans at a press conference on Tuesday ahead of Wednesday’s Champions League clash with Benfica, Mourinho said he was not thinking past his present deal with United. “I think you English media, you have the answer for that,” Mourinho told reporters. Because in one day it says that I’m going to sign a five-year contract, one-billion pounds per season and then the next day you say that I’m leaving and I’m going to Paris Saint-Germain. Mourinho, who joined United in 2016 on a three-year contract, has rarely stayed more than three seasons at any of his clubs. Pressed on whether he would be capable of staying as long at United as the club’s legendary former boss Alex Ferguson, who reigned at Old Trafford from 1986 to 2013, Mourinho made it clear that was impossible. “The only thing I told — and it was true and there was no misinterpretation of my words — is that I’m not going to end my career at Manchester United,” he said. I ask how is it possible in modern football that any manager is going to last 15, 20 years in the same club? I think (Arsene) Wenger is the last one. Email “'I'm not signing a new five-year contract and I'm not leaving for PSG'”. Feedback on “'I'm not signing a new five-year contract and I'm not leaving for PSG'”.